AMODIT has one very nice feature that allows to print a case form. In most cases it is enough. But what should you do when you want to present or print the case form in more nicer or custom way? The answer is quite simple - just use MS Office documents (i.e. Word or Excel) as templates. 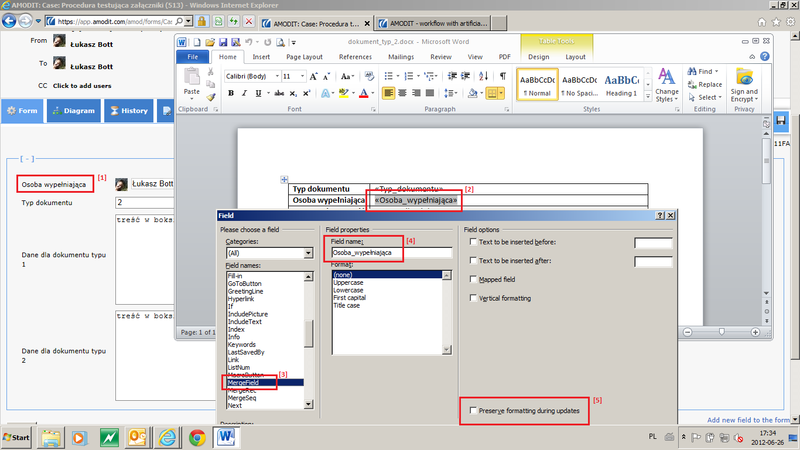 To accomplish this goal you should create your custom MS Office document (I will use a Word document as an example in this post) and attach it to a procedure definition in AMODIT. The following picture shows a few important steps you need to do while editing document templates. Create a case form in AMODIT. The fields may be of different types and using national characters for their names is not a problem. Create your own custom MS Office document with placeholders inside. The placeholders will contain fields values from the AMODIT case form. For each placeholder in the text insert a merge field. The merge field name should correspond to the AMODIT case field. It is important to replace spaces in the merge field name with underscores. One more thing you should do is to uncheck "Preserve formatting during updates" option. 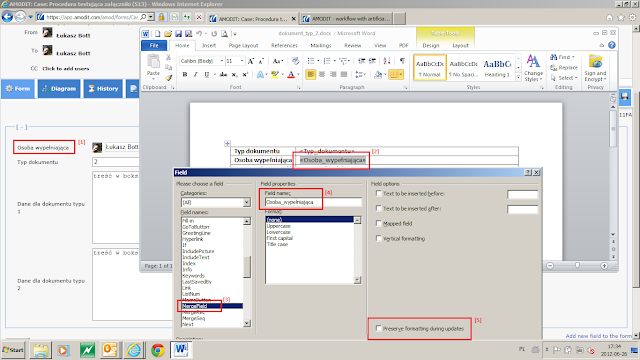 As mentioned earlier in this post the document template should be then attached to the procedure definition in AMODIT. The document template appears on the "Document templates" tab on the case form (). A sample result may look like on the following picture. When you click and open the attached document template () you should see your custom Word document fulfilled with the data from the AMODIT case form ().